Planning now well advanced for the trip to Chad in two weeks. For me this has already meant several jabs, and the final one, yellow fever, will be done privately next week. I’ve also had to buy some lightweight, UV and mosquito-resistant clothes and urgently renew my passport. Africa, then. I have never been there before. We will land in N’Djamena, Chad’s capital, stay overnight, before setting off the next morning. Chad is in the centre of the continent, and we are going to travel to the centre of Chad. 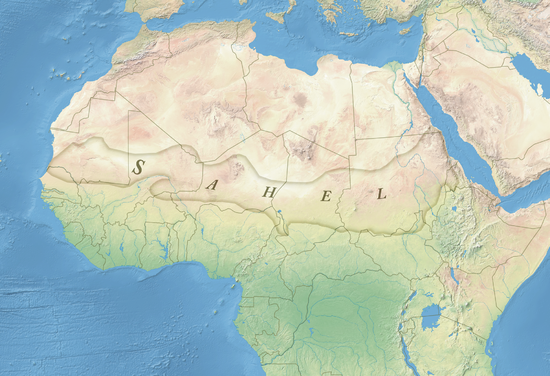 Across the middle of Chad, and south of the Sahara, runs the central semi-arid belt called the Sahel. This belt extends three thousand miles from the Atlantic to the Red Sea and is a region that is experiencing increasing desertification. I’ve never really looked at maps of Africa with such interest before, and I find myself horribly fascinated by the size and spread of the desert. I was pleased to learn security is to be tight, and we will be led by an in-country expert. Mobile phone coverage is good there, as Chad has skipped landlines and gone onto mobile. I like the idea of being able to phone home. Meanwhile I’ve been refining the DRTV script which we are going to shoot. There is a strange dislocation about sitting in a home office in mild-mannered Brighton writing a treatment for filming in the heart of Chad. We may be taking a drone, which suggests we can shoot some aerial shots too. But above all the reason for the script is clear, which is to raise money for those most in need, so it’s not quite as impossible as it might seem. Other than some work I am doing with colleagues in France on a preventing the spread of rabies throughout the Balkans by encouraging vaccination, this Chad project is edging out all other writing. The poet in me, however, is excited. I went to bed the other night wandering how bright the stars might be in what is for me a remote part of Africa and felt nervousness converting to excitement. It’s a fine line. I’ve been thinking of Léopold Sédar Senghor, who was for a time the Senegalese President, among his other accomplishments. His gorgeous poem Night of Sine made a massive impact on me when I first read it in my early twenties. And I shall certainly be stowing his Selected Poems with me for the trip. Here is Night of Sine, beautifully rendered into English by Craig Williamson in the long out of print Rex Collings 1976 edition. Nightwind. Not even a cradlesong. Let it rock us, the rhythmic silence. Nod their heads like babies on the backs of their mothers. the tongues of alternate choirs. Leaning on this hill of clouds, draped in her long milk gown. Inside, the hearth grows dim in close, bitter and sweet smells. and speak like parents when the children have gone to bed. They feared to die, to lose their seminal flood in the sand. This entry was posted in a writer's life, Marketing, Poetry, Travel and tagged Chad, Léopold Sédar Senghor, Night of Sine. Bookmark the permalink. Did you need to declare the drone at the airport?